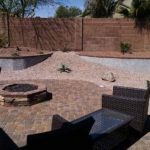 Backyard landscaping ideas for your Arizona yard. We have many options in the low Desert for our back yard. Some parts required major work like excavator hire and some all you needed was a shovel! It is one of the most important spaces in our home and the right design will make it more enjoyable and usable. 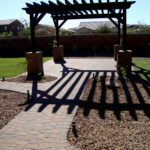 The current trends in Arizona backyard landscaping is synthetic grass, paver patio, desert plants, and a beautiful pergola. We can expand on that with a complete outdoor kitchen, putting green, entertainment areas with a fire pit. There is so much we you can do. Let us help you to design the yard of your dreams. Using digital landscape design could bring your landscaping ideas to life, it can also save you money in the long run! A tree in the right place will give shade in the summer so you’re lowering your energy bill. If you optimize your landscape then you will need fewer wireless home security cameras to cover the outside of your house, reducing your electricity usage. 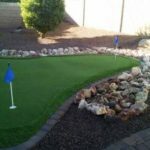 In Arizona, artificial grass is one of the top backyard landscaping ideas or trends. Synthetic grass has come a long way from the old fake turf. You can get a small splash of green in your yard with virtually no maintenance, no water, no mowing. It is pet safe and kid friendly. If you are looking for some entertainment, let us install an artificial grass putting green. Challenge your friends and have fun entertaining in your new backyard. 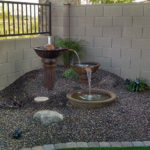 Fountain or water feature – the sound of water trickling down a fountain will add a sense of relaxation to your yard. It is also a focal point for your design to dress up a corner or section of your patio. You can use the water feature to create a small area to sit in and relax. 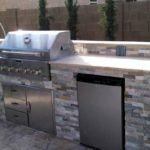 Outdoor Kitchen and BBQ – install a custom built-in BBQ complete with counter space, fridge, trash area, and drawers for utensils. Extend the indoors out with an entertainment area designed to flow from your house out to your yard. 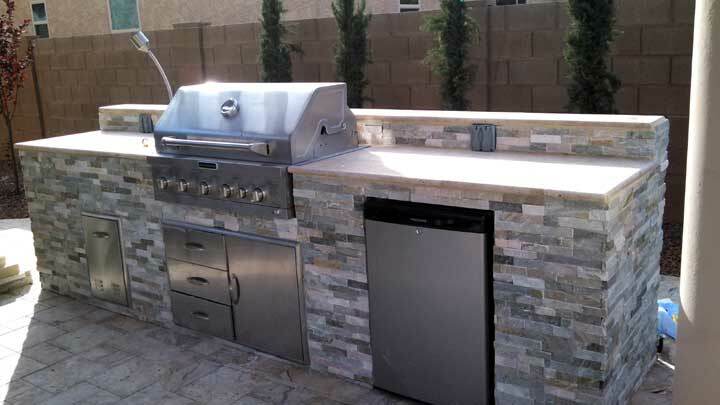 Arizona is the perfect place for outdoor entertaining. Add a a gazebo, patio, and fire pit for the perfect outdoor area. Paver patio – Another hot trend in backyard landscaping ideas is an extended patio. We can create a patio out of pavers or travertine with walkways away from your house. You can create intimate areas to enjoy your yard and relax or expand your existing patio for a great entertainment area. Paver patios is wonderful solution to typical concrete. Paver patios are durable and offer a variety of colors and patters to please almost everyone. Pavers are very affordable and do well in our desert lifestyle. Fire Pit – Add a fire pit to your backyard patio. We can custom build a gas or wood burning fire pit. The fire pit can be round, octagon, square, you name it. The firepit can be designed with a various materials for the top and sides. You can have a basic pit with stucco sides or add cultured stone for beautiful, custom look. The top can be in stone, flagstone, or pavers. It can be as big or small as you desire. Gas fire pits area as easy as turning on a switch with no smell or smoke. Misting System – an outdoor misting system will be one of the best investments for your backyard landscaping if you are a summer resident. They provide comfort and cooling so you can enjoy your backyard throughout the year. 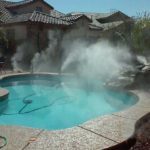 A professional misting system can be installed around the pool, patio, or an extended patio area. The options are endless.